Should you notice a loss of ¼” or more a day or you are filling your pool more than once a week you may have a pool leak. Let us handle your leak to get your pool back on track. With the latest technology in non-invasive leak detection equipment we can locate your leak quickly and accurately. Most pools will at some point lose water through a leak. Leaks can be frustrating and costly as well as very tricky to pinpoint yourself. Allow us to utilize the industries top technologies to pinpoint your leak efficiently to get you back to enjoying your pool. One of the most frustrating issues pool owners face is a leaking pool. A leaking pool can be a costly expense with water, chemicals and potential damage to pool structures and surrounding areas. Our thorough leak detection process utilizes the most innovative technology in the industry to provide fast and reliable results. In the past the leak detection service was a long and drawn out process. A guess and check technique of isolating different areas of the pool and monitoring water levels was commonly used. This type of procedure took days, even weeks to complete, all the while leaving your pool still leaking during the process. Our new equipment will allow us to take a different approach using similar principles. Even though we break the pool down into different areas we are able to test them for leaks in just one day in most cases. 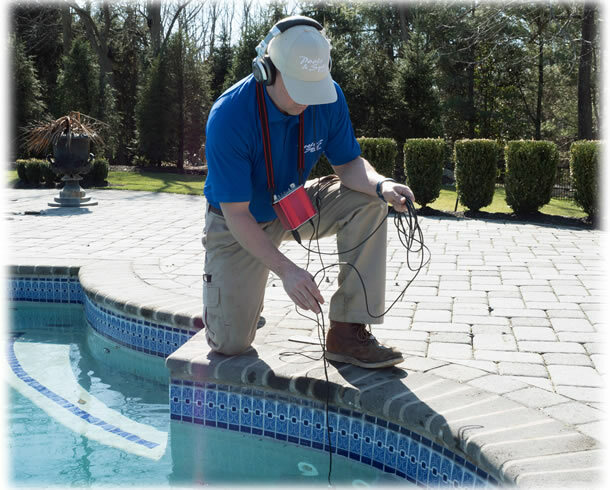 Our leak detection service begins with a survey that allows our technicians to become acclimated to your pool and its specific attributes as well as potential issues. Upon arriving at your pool a full visual inspection is done noting all possible leaks “areas of interest”. The latest technology is then used to “listen” to your pool in and around your “areas of interest”. For most pools in just 1 hour we can properly diagnose the leak or rule out the areas of interest, than prescribe the next step based on the type of pool you have. Once the leak or leaks are located we will supply the homeowner with documentation of all test completed and their results. For small leaks in liners and cracks in skimmers we can repair same day. For more complex issues we will have a project manager meet with the homeowner to discuss repair options. Step by step process keeping homeowners advised of all steps and procedures. Detect leaks in all types of pools concrete, vinyl and fiberglass. Pinpoint leaks in liners quickly using the industries best technology. Full documentation of tests and procedures done.